“For the Glory of God and Future Generations” – these words, engraved on the granite cornerstone of St. Joseph Church summarize the inspiration held by a small group of Ukrainian Catholics on the Northwest Side of Chicago. Under the leadership of Fr. Joseph Shary, the faithful tried for many years to build a new Ukrainian religious institution. Their efforts were crowned with success and their dream to build the most beautiful Ukrainian church in America was achieved. The privilege of organizing this new parish fell to 29-year-old Fr. Joseph Shary who, on August 12th, 1956 served the first Divine Liturgy at the Roman Catholic Church of St. Benedict. An organizational meeting met the following night at the Zdeblick home. Present were the families of Gawaluck, Gawaluch, Marinoff, Sawkiw, and Kuzma. By the following Sunday, the parish had grown to over sixty families, who, in a meeting following the liturgy dedicated the parish to St. Joseph, protector of families and decided to celebrate according to the Gregorian Calendar. 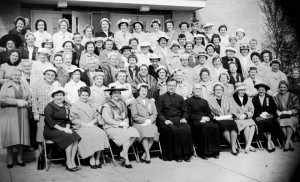 By the third Sunday, August 26th, 1956, the parish had grown so quickly that they decided to celebrate liturgies in the lobby of St. Patrick High School, where parish life was centered until 1958. Towards the end of 1957, four parcels of land were obtained for the building of a new church. This territory of over 80 acres was located between the intersections of Cumberland and Foster, and East River Road and Argyle. Another parcel of land was earmarked for the development of a Ukrainian village. Mr. John Podney was responsible for coordinating all planning parish lands and property. On April 13, 1958 the land was blessed and construction of a church and religious and community center begun. Construction was completed by November 2, 1958, when parishioners of St. Joseph prayed in their own Church for the first time. 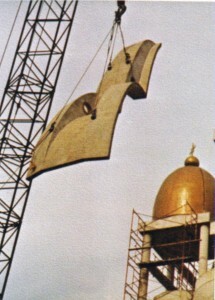 In 1959, the parishioners designed and built an iconostas in the traditional Byzantine style. This original iconostas has been preserved and stands in the Church’s chapel dedicated to St. Paraskevia. The last Divine Liturgy celebrated in the “old church” took place on March 20, 1977. Parish membership continued to grow, and the decision was made to build a new, large church. Construction was officially undertaken on October 1, 1975. Consideration was given to 32 architectural designs, and Zenon Mazurkevycz project was chosen. Bishop Jaroslav Gabro approved the project and on April 6, 1975 blessed the building site. A year later, Patriarch Josyf Slipyj visited the parish and blessed of the foundation of the new Church. Two granite cornerstones were blessed by Bishop Jaroslav Gabro on December 26, 1976. Important documents related to the construction of the Church, and other precious artifacts were sealed into the wall of these granite blocks. These included a piece of coal from the Donbas region of Ukraine and a rock from the Dnipro River. The first Divine Liturgy was celebrated in the new Church on November 1, 1976 for the intention of the Beatification of the Servant of God Metropolitan Andrei Sheptytsky. The second half of the golden years continued to bring change and growth. In 1983 then pastor, Rev. Dr. Andrij Chirovsky replaced the original crystal cross-chandelier with a more traditional byzantine style panikandylo (candelabra). Likewise, the long and important task of painting the inside of the church with iconography was begun. Due to unforeseen circumstance, it was never completed. In 1988, with the generous donation of the Podlusky family, an iconostas was installed. Between 1985 and 1987 Fr. Mykhailo Kuzma served as pastor of St. Joseph parish. In 1988, under the guidance of then pastor Fr. William Bilinsky, in commemoration of the millennium of Christianity in Ukraine, St. Joseph’s erected a new rectory to the west of the grotto. In addition, the old church building was converted to office space, classrooms, and an expanded Selfreliance Credit Union branch office. The annual parish carnival continued to thrive, as did weekly Bingo. Fr. Tom Glynn also joined the parish as associate pastor in 1989. By the summer of 1995, change was under way. Fr. Bill retired as pastor from St. Joseph’s, and was replaced by Fr. Pavlo Hayda who arrived with his wife and two children. The annual carnivals were replaced by an annual picnic. Over the next few years, the bare concrete inside the church was painted, and the gold color on the domes were re-glazed. Annual New Year’s Eve dances became common and were looked forward to events. The parish youth group, Sts. 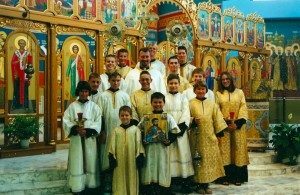 Cyril and Methodius was revived, and a new large group of altar servers was formed. From a liturgical standpoint, the parish began offering forgotten yet traditional liturgical services, such as Liturgy of the Presanctified Gifts, and the Rite of Christian Burial service, in lieu of a Funeral Mass. Over this period of time, the parish also had the honor of hosting several events which were more ecumenical in nature, such as the 2000 Annual Eparchial Conference, and the 2006 Encounter of Eastern Catholic Churches. The parish became known as the “Welcoming Parish”, and as such began offering services according to the Julian calendar in order to meet the growing needs of the new wave of Ukrainian immigrants who were moving to the northwest side of the Chicago metropolitan area. In January of 2008, after the sudden death of Fr. Pavlo, the parish welcomed it’s new and current pastor, Fr. Mykola Buryadnyk, with his wife and son. Under Fr. Mykola’s guidance, the parish community has continued to grow, more than doubling it’s roster of weddings and baptisms. The parish picnic has been replaced by an annual two day Uketoberfest, and renovations on the church building continue, most recently with work on the completion of the iconography which was begun more than 25 years ago. The grotto mosaic depicting the Mother of God at Hoshiw was also renovated and was blessed by his Beatitude our Patriarch Sviatoslav Shevchuk during his first visit to Chicago. In 2009, Fr. Volodymyr Kushnir, with his wife and daughter, joined the cadre of clergy serving the St. Joseph parish community. As Associate Pastor, he contributes to the continued growth of the parish. Fr. Mykola, Fr. 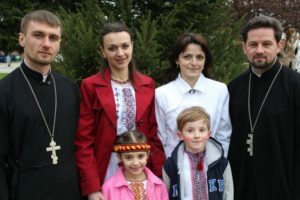 Volodymyr, and their families in 2011. Under the guidance of the parish, organizations such as Ukrainian Saturday School “Ridna Shkola”, the choirs Irmos and Kheruvym, theater ensembles Homin and Dyvo, the School of Ukrainian Martial Arts Bojovyi Hopak, the Vyshyvanka School of Dance, the Sts. Cyril and Methodius youth group, bible study groups, and the Spirit of St. Joseph Society continue to contribute to the spiritual growth of the new generation, yet haven’t forgotten their Ukrainian Tradition.